Mission To The Blind came into being on 1st June 1992 as an expression of God’s love and concern for visually impaired people in India. It is registered as a Trust with the Government, with the Income Tax Commissioner (Exemptions) under Act 12 (A) and with the Ministry of Home Affairs, New Delhi. The accounts of the Trust are audited by Chartered Accountant annually and submitted to the Income Tax Department and to the Ministry of Home Affairs in New Delhi. Mission To The Blind is also a member of India Missions Association (IMA). MTB is governed by a National Board of Trustees comprising of Christian leaders from various parts of the country. 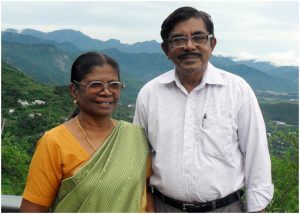 Late Mr. Sam R Thanaseelan was the founder and Director for the mission from June 1992 to till May 2008. He continued to serve as the Consultant till his Home call on September 29, 2012. From June 2008 to May 2017, Mrs. Jeya Thanaseelan was holding this responsibility then since June 2017, Mr. Jaikumar A. has been the National Executive Director. The staff comprises of 126 men and women from ten language groups, including 30 visually challenged persons, working in 19 states of India. Mission To the Blind concentrates on the holistic development of people with visual impairment.